The Reformation closed in August 2018, or at least the long term tenants moved on then. I’ve left the review up for posterity. One of the things that’s always made TripAdvisor a patchy guide to restaurants is that it’s always had a rather loose definition of what a restaurant is. It used to be the case that restaurants and cafés were all lumped together, so the ten best restaurants in Reading included the likes of Tutti Frutti and Tamp Culture. Cafés tend to do better than restaurants on TripAdvisor: the algorithm is a numbers game and cafés, after all, get more customers. On one level, there’s nothing wrong with this – Tutti Frutti and Tamp are both great places – but on another it doesn’t help when deciding where to go for dinner. TripAdvisor, possibly recognising the problem, made some changes recently to divide establishments into “Restaurants” and “Coffee & Tea”. In principle this should have improved things, but if anything it’s even more confusing because it’s been somewhat randomly applied. So places like Picnic and Workhouse – not restaurants per se, but certainly much more than just hot drinks – are now in the “Coffee & Tea” section, and yet Nibsy’s, Tutti Frutti and My Kitchen are still, apparently, restaurants. Your guess at the rationale behind this is as good as mine; I think they might have used a Magic 8-Ball. The effect of those changes, random and incomplete though there are, is to clear out some of the noise in the TripAdvisor rankings. It’s also why I went to the Reformation this week, because now that many of the cafés have been taken out it is – with the exception of Quattro – the highest rated restaurant in Reading. Not only that, but people I know whose judgement I trust recommended it. Nothing fancy and nothing pretentious, they said, just pub classics done very well indeed. Sometimes that’s all you want, so I got in the car on a sunny day and went up the A4074 past the sites of triumphs (The Pack Saddle) and disasters (The Pack Horse), taking the next right for the village of Gallowstree Common. Despite the photo on the website, where the building looks more suited to a horror novel than a restaurant review (the village name would be strangely appropriate, come to think of it), the Reformation is another of those handsome country pubs that I’m always banging on about. There’s a nice garden at the front (on the quiet main road) with pub tables and little shed-ette for smokers (very civilised). Stepping through the door has the opposite effect to the Tardis – I was expecting a massive restaurant but instead got a pretty small pub. Perhaps I shouldn’t be surprised, but so many pubs these days have turfed out the drinkers in favour of diners that seeing space for only twenty covers in the dining room struck me as unusual (in fairness, there’s also a conservatory although it was nowhere near as cosy and inviting). The décor was the usual mix of Farrow and Ball paint tones and mismatched furniture, with witty quotes and the signatures of the Kaiser Chiefs, amongst others, on one wall (it seems they’ve played a gig there). It felt like a pub with the right balance between restaurant and local boozer. Having checked the menu online before coming out I knew that this week was going to be vegetarian week. Arriving at the pub, however, I was disappointed to see that the menu had changed when the website had not. Of course it’s good for menus to be regularly refreshed but on this occasion is meant that my tantalising veggie main, picked off the menu on the website (lightly spiced bubble and squeak cake, creamed spinach and peas, paneer, soft poached egg – doesn’t that sound good?) had been replaced by what was basically mushrooms on toast. I’m nothing if not committed, though, so I soldiered on. I also knew I would not get another chance this month to live up to my veggie promise. But all that was to come. I was tempted to go full vegetarian and order the baked Camembert to share, but I couldn’t persuade my companion to go for it and eventually I ruled it out as not being a sufficient test of the kitchen’s skills. 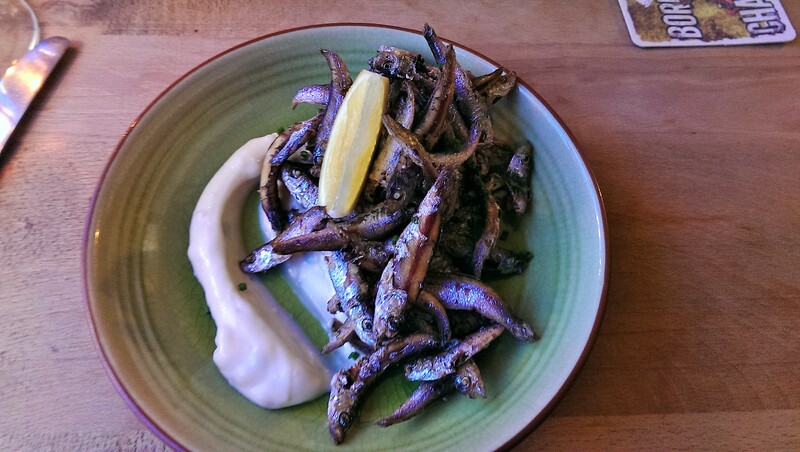 Instead, the deep fried whitebait with garlic mayo was a near miss of a consolation prize. The whitebait were crispy and the portion was generous but the mayonnaise didn’t have the courage of its convictions (nowhere near enough garlic) and the fish themselves were incredibly salty. All a little bit out of whack, and then to cap it all the Camembert turned up at another table and I realised I’d made a big mistake (huge): it looked bloody lovely and generous (huge). The potted local rabbit was a lot more like it. A beautiful little ramekin of shredded meat but packed with loads of other things too – ever so finely diced carrot and cornichon, rosemary, juniper berries. Just lovely – fresh and clean with just enough of a vinegary edge to stop it being cloying. There wasn’t enough toast (or, as the menu called it, “chargrilled bread”) – there never is with this kind of thing – but the salad was beautifully dressed and went nicely with the remaining rabbit. After all, you can only pile it so high on a piece of toast before it looks a bit silly. 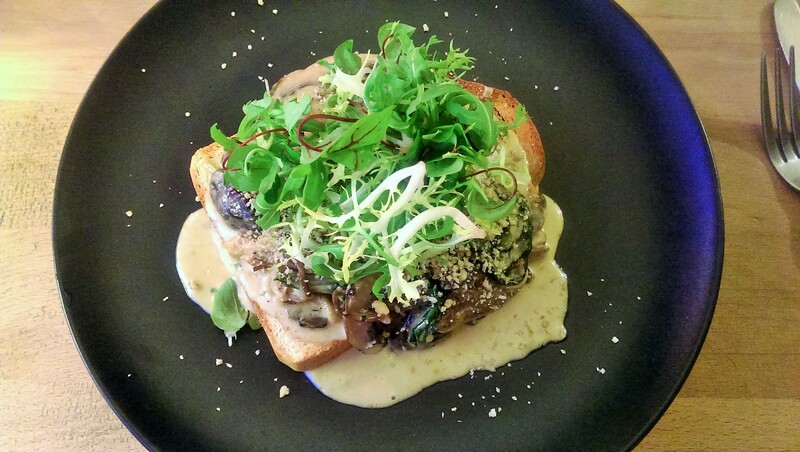 The next course meant my appointment with the aforementioned mushrooms on toast. They were cooked with wild garlic and Madeira cream, sprinkled with Stilton crumb and then topped with some salad leaves. It was fine but no more than that; if I’d cooked this at home I’d have been happy with it, but as a main course it left something to be desired. The bread was nothing special, the Stilton crumb wasn’t terribly cheesy and as a texture it just got swamped by the sauce. The salad wasn’t dressed so I ended up mopping the plate with it – serving it on the side would have made more sense, instead of putting it on top as a cheffy gesture. The mushrooms and garlic were tasty enough, but I couldn’t shift the feeling that I’d eaten a supersized starter, and twelve pounds for this felt a bit much. If only that paneer had still been on the menu. Ironically the other main, which was far more successful, was in essence a supersized breakfast. 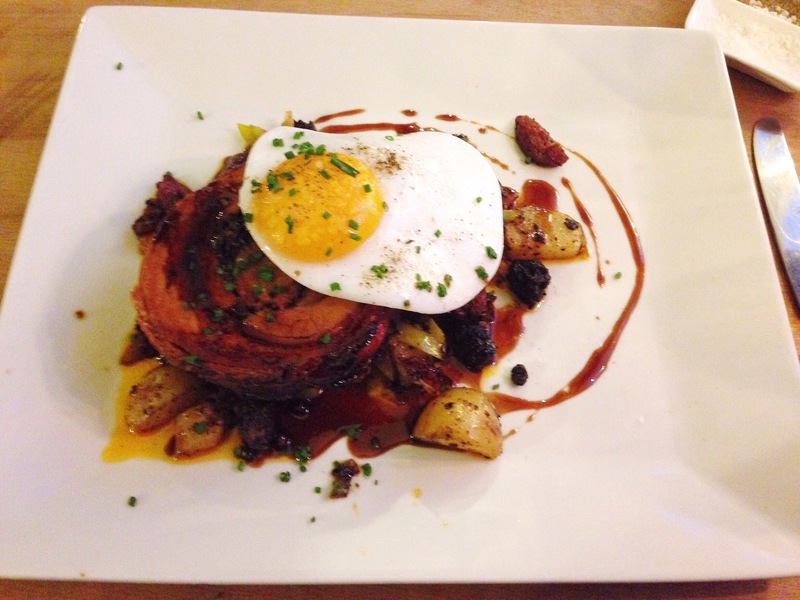 A glorious spiral of pork belly, like a Swiss roll for carnivores, came on top of a hash of firm potatoes, sweet leeks, rich crumbly black pudding and punchy, piquant chorizo. If that wasn’t enough (and it would have been) the most gorgeous soft-yolked fried duck egg was perched on top of the whole lot, ready to release liquid gold at the touch of a knife. If you’re not hungry reading all that then this really isn’t the dish for you but if you are believe me, it more than lived up to that billing. It was a symphony of pork products, although you probably didn’t want to think about just how bad for you it was. I finished nearly all of it – a little wobbly section of pork belly was never going to get eaten, but I had no complaints. The wine list at the Reformation is one of those fantastic ones where many are available by the glass, where you can have 125ml, 175ml or 250ml and where you aren’t penalised for smaller measures. Close to my perfect wine list, in fact – all they had to do was offer 250ml and 500ml carafes and they’d get a gold star for wine alone. We tried three in total: the unoaked chardonnay was smooth and creamy, the Gaillac fresh and sophisticated and the Languedoc red (the cheapest red on the list) was the kind of robust unpretentious wine you could glug all evening. Really impressive stuff, and far better and more interesting than countless wine lists I’ve come across recently. So, two good dishes and two disappointing ones. In those circumstances, having dessert felt as much like a tie-breaker as a chance to indulge further. I was tempted by the cheeses (a great British selection by the superbly named Pong of Bath including Lincolnshire Poacher, one of my favourites) but the call of the school dinner was as so often too difficult to resist. Besides, little cheers me up quite like sticky toffee pudding. Alas, again it was close but no cigar. It was on the generous side but it was far too sweet (even for me) and there wasn’t enough butterscotch sauce or enough ice cream. I chose ice cream over cream but on reflection cream would have been a better option to try and tone down the onslaught of sugar. It reminded me strongly of those tinned Heinz steamed sponge puddings that were such a treat in my house back in the 80s. That’s not entirely a criticism – I could go one right now, in fact – but I think I expected better. And that was a problem throughout the mail, in hindsight – however good it was I think I frequently expected better. That might have been my fault for reading TripAdvisor or listening to some of my foodie friends, but whoever’s fault it was it still fell flat. I always finish sticky toffee pudding, but I left some of this; the uncleaned plate had a certain sadness to it. 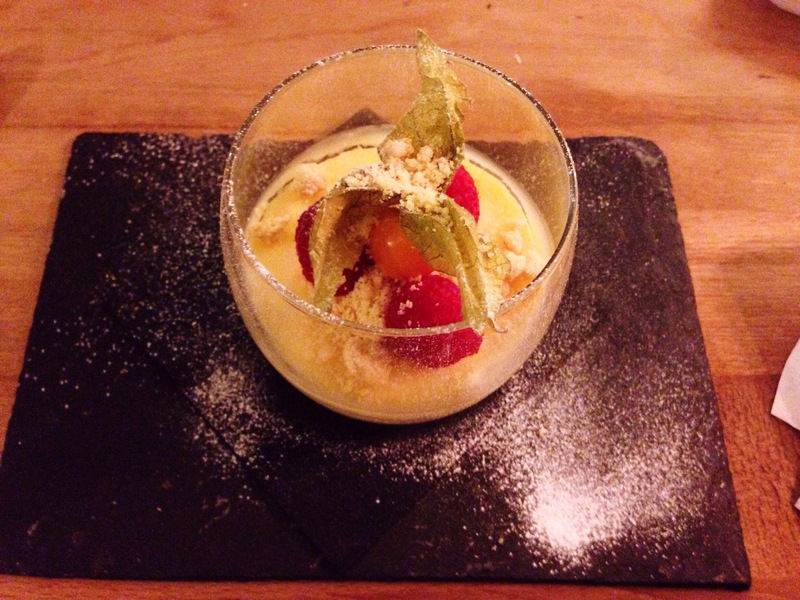 Honours ended up even though, because the lemon posset was beautiful. It had the lightness and sharpness that had been missing from the STP – a perfect way to refresh the palate after the richness of the belly pork. If I was being fussy I would have liked a bit more of the shortbread crumb on top (although that might have run the risk of turning it into an upside down cheesecake), the physalis was a pointless adornment and the icing sugar was too – but I feel I may have been quite fussy enough already, so let’s just say that I liked it a lot. My mixed feelings about the food were, if anything, made even sharper by just how brilliant the service was. The waitress was lovely throughout – knowledgeable about the menu, full of ideas and recommendations and genuinely enthusiastic about some of the choices we made. Even though it was just a random visit on a weekday evening she lifted it and made it feel a bit like a special occasion. She was so good, in fact, that I started to doubt myself: maybe it was me, rather than the kitchen who was having an off-day? Could all those positive reviews really be mistaken? It felt like a real puzzler. The meal for two – three courses each along with three glasses of wine and a soft drink – came to sixty-four pounds, not including tip. You’ve probably gathered by now that I wanted to like The Reformation more than I actually did. And there was stuff to like, don’t get me wrong – that rabbit, the service, the smoker’s shed, the witticisms on the walls – but it felt very much like the cliché of a meal of two halves; had I foregone the vegetarian main, perhaps the number down there would be higher. So, this isn’t the rave recommendation you might expect from TripAdvisor, but a cautious suggestion that the Reformation is worth consideration next time you feel like a drive in the country and a meal in a pub. It’s not completely unqualified, though: if you love meat it’s probably worth the trip and the superb welcome, but if you’re a vegetarian who likes a decent portion (you lot snickering at the back can just cut it out) then you might want to give it a miss. The funny thing is that despite the fact that some of the dishes were disappointing I still left wanting to go back. Like a darts player who keeps hitting fives and ones I feel like I just need another shot and I’d get the treble twenty. So yes, I’ll be making a return visit. And I will order that bloody Camembert, just watch me. Even if I have to have it all to myself. Don’t think I won’t. Siblings Home closed in June 2017. I’ve left the review up for posterity. Some of my readers have told me that they’re members of the “scroll down and scroll back up” club. They look at the rating first, then they go back and read the review. Just to level the playing field for everybody just this once: I absolutely adored Siblings Home. It opened on Valentine’s Day, appropriately enough, and if I’m not careful this review might end up reading a bit like a love letter (don’t say you haven’t been warned). Siblings Home is tucked away on a sidestreet just off the main drag in Caversham. It’s a two minute walk from Costa Coffee, but in all other respects a universe away: the front is a beautiful double-aspect room with lovely light from those big, big windows. Inside, it’s full of reclaimed wood and old school furniture, exposed lights hanging from the ceiling. I know – what I’ve described sounds like all sorts of restaurant and café clichés, but Siblings Home is a very different beast: it’s clearly been done with love by someone with a very good eye (and, I’d guess, nowhere near as much money as the big chains) so what could seem like a piece of calculated bandwagon jumping is actually a beautifully warm and considered space. It all feels a bit Labour And Wait, like someone has found a great café in Hoxton or the North Laine and, through some magical realism variant of Control X and Control V, had dropped it incongruously on a street corner in Caversham (I spotted a stool that had “David Bowie” written on it in Tippex, which only reinforced that impression). I couldn’t think of anywhere even remotely like it elsewhere in Reading, just places that had aimed for this kind of look or feel and missed by varying degrees. When I got there on a weekend morning there were already a bunch of hip young (and not so young) things inside, drinking coffee from chunky mugs and luxuriating in the warm word bath of the weekend papers. Aside from the front room there are two others: one full of homewares you can buy to take home and a little back room which has extra space for customers. Of course, all this only works if the food is good and by this stage I was hoping against hope that I wouldn’t be sitting through another depressing knockout victory for style over substance. The menu, on a blackboard behind the counter, looked promising and made all the right noises: a few breakfast options revolving around toast, granola or muesli and just four sandwiches, all either available in toasted sourdough or piadina, a thin Italian flatbread. In the interests of research, we tried both types of sandwich and soon realised that substance was going to triumph over style on points. Chorizo, Jarlsberg and mushroom in toasted sourdough was downright marvellous: the sourdough was sliced thinly enough for the insides to melt properly and the outside had been lightly buttered (I think) for better toasting. The flavours were excellent; nice, thin piquant chorizo with a decent amount of creamy Jarlsberg and, last but not least, the rich, earthiness of the mushrooms. 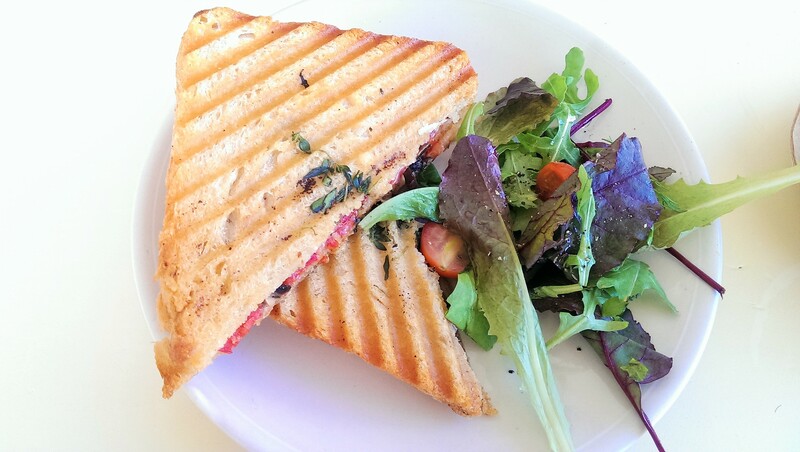 A little sprig of thyme had been pressed onto the outside of the toastie, and that attention to detail, that interest in fresh ingredients and that understanding of flavours, in such a little thing, made me love Siblings Home even more. It also came with a salad I actually wanted to eat – a little red chard and rocket, lightly dressed, along with some tartly sweet cherry tomatoes adding zing and colour. Having it done so well and so simply here just made me realise how many other places bugger this kind of thing up. All the salad got eaten, which is the lunchtime equivalent of a standing ovation. 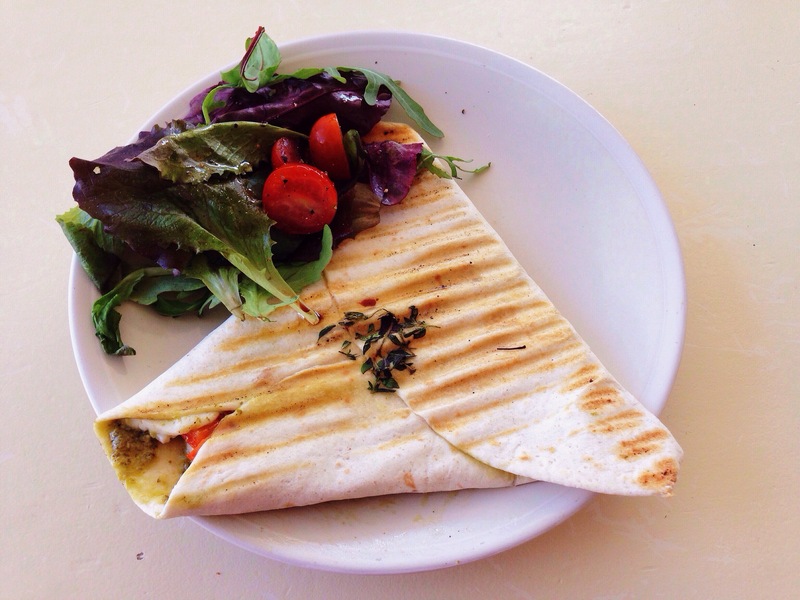 The piadina was just as delicious. The flatbread had been folded into a shape something like a tricorne, and inside it was packed with firm salty halloumi, fresh crunchy red pepper and oodles of pesto. I didn’t know what to expect from the piadina itself but the texture was magnificent – not brittle like a tortilla or spongy like a panino, it stood up to the grilling perfectly. The whole thing together was a wonderful sandwich – no wasted space, that perfect blend of salty and sweet filling right up to the edges, every mouthful an utter delight. At the end I took the rest of my salad and used it to mop up the last of the pesto on my plate – which is probably the lunchtime equivalent of an even longer standing ovation. Both sandwiches cost four pounds fifty and were made there and then behind the counter rather than sitting there waiting for someone to order them: again, I was reminded how many places in Reading offer so much less for more money. The drinks were excellent, too. Siblings Home serves proper leaf tea in proper pots, with vintage mugs to drink from and milk served in little glass inkwells (you might find that a little twee but by that stage I was completely charmed by the whole thing). My Earl Grey – from Martyn’s of Muswell Hill according to the blackboard – was very nice indeed. The latte, on the other hand, got rave reviews although I’m told it was much more like a big comforting café au lait than a little, intense, densely frothed latte (my companion started to wax lyrical about coffee in Paris at this point, and truth be told I zoned out and paid more attention to my paper). The only misfire was the pain au chocolat which wrapped up proceedings. I really wanted one but it was dense and chewy where it should have been light and flaky. No matter: by then I already loved the place and was in a distinctly forgiving mood. Besides, surely it was my fault for not going for the chocolate brownie or the intriguing-sounding pear and lavender cake? Service was spot on from start to finish. The young lady serving was bustling about bringing drinks and making up sandwiches but managed to be really friendly and chirpy and when our plates were cleared by one of the titular siblings she seemed genuinely pleased that we’d enjoyed our lunch. The enthusiasm was infectious – I left wanting to come back, soon, and to support them by spending money (and having lovely food and drink. I’m not completely altruistic). The bill, for two sandwiches, two rounds of hot drinks and a pastry was twenty pounds. We could have spent less but were in no hurry to leave: I could quite easily have grabbed some magazines or got out my Kindle and settled in for far longer. Although I’m no Mary Portas, it’s worth briefly mentioning the other arm of Siblings Home because the shop in the middle room sells lots of lovely things, also clearly put together by someone with a very good eye and an excellent contacts book: from plain, timeless, practical earthenware mugs and dishes to sturdy, beautiful chopping boards, from cacti to cards, from bars of chocolate and jars of local honey to handsome woollen blankets. My one regret is that I didn’t pick anything up – but in my defence I was already a bit giddy from having such an unexpectedly fantastic lunch and things could easily have got out of control. When you review somewhere every week, this lark can get a bit dispiriting. Mediocre or muddled places, poor food and service, unimaginative concepts, mean-spirited portions, bad execution: they sometimes make me wonder whether my standards are just too high. Maybe my lofty ideals aren’t realistic, and Reading is just like everywhere else and we should buckle down and accept our lot – chains, 2 for 1 vouchers, Groupon deals, making do – and getting on the train to Oxford or London if we don’t like it. But then I go somewhere like Siblings Home that just gets everything right – no fannying around, no cobblers about “artisan products”, no box-ticking attempts to be everything to everyone. Instead, a small, sensible range of simple, excellent food in a beautiful, stylish room along with friendly, enthusiastic service. It makes me realise that it can be done, even if I’m sure the people at Siblings Home make it look a lot easier than it really is. This place reminds me why I started writing this blog in the first place. And finding it is a little bit like falling in love, all over again. Artigiano has changed hands and is rebranding as Broad Street Bar & Kitchen over March and April 2018. I’ve left this review up for posterity. Let me paint you a picture: one of the reasons the dining scene in Reading can be a confusing place is because many establishments don’t seem to have decided quite what they want to be. So you get indies like Nibsy’s which look so polished in terms of their presentation and branding that you could easily imagine they’re part of a chain on the one hand, and chains like Bill’s that are trying really hard to look independent on the other. When even the Gregg’s on Queen Victoria Street is sporting fake exposed brickwork to try and look bang up to date, no wonder people can feel baffled. But it’s not just about appearances, there’s also a degree of multi-tasking involved. So we have pubs that do Thai food, wine shops that do charcuterie, cafes that also sell home accessories. Part of it is also about trying to offer something all day to justify those high rents: the chains are good at this, so the likes of Carluccio’s, Bills and Côte will go effortlessly from breakfast to lunch through to dinner, keeping the tills ringing all the way to closing time (everyone’s at it, in fact: this week Pret A Manger announced that it was going to trial serving evening meals in one of its London branches). Part of it though is about trying to widen appeal, and it’s a hard balance to strike – if it works, a place looks like a brilliant all-rounder. If it doesn’t, it has an identity crisis. Artigiano is a very good example of this in action. It’s a café by day which morphs into an altogether different venue in the evenings, so you can have coffee and sandwiches at lunchtime, tea and a cake in the afternoon and then, as the sun goes down, the emphasis moves to wine, craft beer and nibbles, with a side order of occasional live music. It helps, too, that it’s been so attractively fitted out – all hard wood, smart mid-century inspired furniture and industrial fittings (yes, and exposed brickwork, naturally). It stands out a little at the less swish end of Broad Street. Get Reading recently wrote a very interesting piece, prompted by Primark’s impending move into the old BHS site, that said the dividing line was anything west of Waterstones – and much as I love wandering round Clas Ohlson I think they probably have a point. So, Artigiano is an independent with the polish of a chain, in one of Reading’s less attractive locations, trying to cover all bases at all times. That’s quite a challenge: can they pull it off? It was packed when I turned up over the bank holiday weekend looking for a spot of lunch and I could see why. They’ve done a good job of breaking it up into sections with lots of different furniture styles from functional for eating to comfy for drinking. The ground floor, to me, feels a little more sterile whereas the upstairs is much softer and more welcoming (and if you can grab one of the tables for two on the first floor by the window you get a terrific view of Broad Street). They also have quite a lot of tables outside, and the weather was almost nice enough that they didn’t feel ludicrously optimistic. The lunch options were limited to ready-made salads (in the fridge next to the counter) and sandwiches, which were laid out across the counter next to the range of cakes. Personally I found that offputting: I’d prefer everything to be wrapped or covered as I’m not a fan of sneezemuffins or coughcake. I soldiered on regardless (maybe it’s just me – let’s just say that you don’t want to know how many times I wash my hands every day). It’s very much a café experience – no table service, so the sandwiches were plated up there at the counter and we took a table number for our hot drinks which followed later. The sandwiches were generally tried and tested combinations rather than bursting with innovation: cheese ploughmans, “New York deli” i.e. pastrami and cheese, falafel wrap (it seems to be a legal obligation for sandwich chains to dish up cold falafel these days even though cold falafel are a sad parody of how falafel should taste). The most interesting-looking one was roasted vegetables with both houmous and sweet chilli sauce – I didn’t order it, I regretted it and then when the sandwiches I did try were both disappointing I consoled myself with the thought that it wouldn’t have been good anyway. We went for a chicken caesar wrap and a chicken and bacon baguette, and the waitress serving asked if we wanted them toasted. I found that plain odd: I can understand lobbing things in a panini press where there’s cheese involved but otherwise it seemed an eccentric move to try and put what is essentially a chicken baguette in a toaster. We declined. 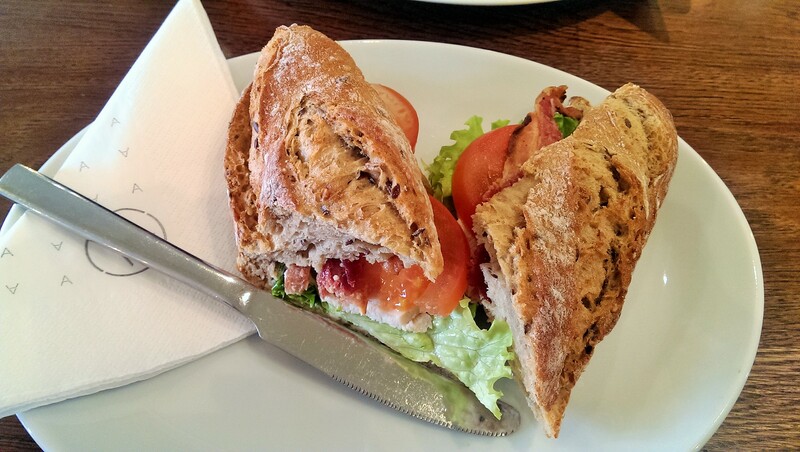 The bacon and chicken roll was labelled as a “chicken club”. As far as I know a club sandwich is usually a double decker on sliced bread whereas this was a single decker wholegrain baguette. The bread was OK – it looked nutty but tasted surprisingly plain (especially compared with the “artisan bread” at Pret or the fresh sliced bread at Picnic, both of which are top notch). Inside was a meagre smear of mayonnaise, a single layer of lettuce, sliced tomato and some chicken and bacon. Both meats – the chicken in disturbingly uniform slabs, the bacon a pair of floppy strips – had the appearance of being pre-cooked catering food and were glacially cold. Artigiano’s website makes much of the quality of its ingredients but it really didn’t feel that way from where I was sitting: I found myself wondering just how freshly assembled this sandwich had been, and more to the point what exactly it had been assembled from. Worst of all, it was so dry, so tasteless and so disappointing that half of it was left on the plate at the end: carrying on would have just been throwing worse calories after bad. 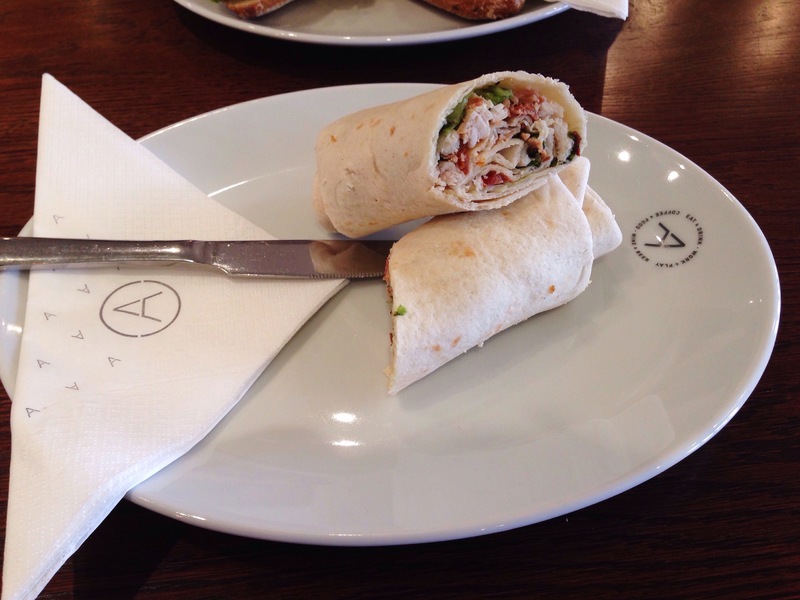 The other sandwich, the chicken Caesar wrap, did get polished off – although that was more a sign of its diminutive size than its deliciousness. It was in two short halves, which were even shorter when I realised that a lot of each end was taken up in a big stodgy clove hitch of tortilla with no filling. As for the filling there was, it aspired to inoffensiveness: the shredded chicken was clean-tasting, if bland, but there was no Caesar dressing that I could make out and certainly no Parmesan. The lettuce was nice enough (although really, how exciting can lettuce get?) and there were some small bits of bacon scattered throughout – less than I would have liked, but by now “less than I would have liked” was becoming a theme. The suggestion was that this also contained sun-dried tomato, and on a very close inspection I could just about find what might have been the tiniest pieces of sun-dried tomato known to man. The implication seemed to be that they had someone in the kitchen whose sole job was to cut sun-dried tomatoes into almost undetectable pieces: if so, they really need to devote their considerable knife skills (or laser skills – they may well have used one instead) to something else. The only thing that wasn’t less than I would have liked was the cost – four pounds fifty felt like an astonishing amount of money for such a small, ordinary sandwich. The price was also the reason why, although this aspired to be inoffensive, it was destined not to get there. So, that’s all the bad news. The good news is that the tea and coffee were brilliant. The tea was proper loose leaf tea in a sensible, generous pot with a removable strainer basket: I managed to get two decently brewed, un-stewed cups out of this and it was gorgeous, fragrant Earl Grey. I’ve not been to Yumchaa yet, but on current form this is my favourite tea in Reading – so much better and more generous than chains like Pret or indies like Picnic and even Lincoln. I’m reliably informed that the coffee was delicious too – with a hint of liquorice but without any burnt note. It was two pounds seventy five, whereas my huge pot of tea was two pounds thirty. I make that tea one, coffee nil – even if that puts me out of step with ninety-five percent of Reading. Service was friendly, although most of it happened at the till (and this largely consisted of cutting the sandwiches in half and plonking them on a plate). When the drinks were brought over there was no chirpy “enjoy your lunch” and there was also no goodbye holler as we left shortly after. I’m sure that on previous visits there has been more warmth and welcome, but this time it all felt a bit blank and flavourless. Like the sandwiches, in fact. The bill for two sandwiches and two hot drinks was a touch under fifteen pounds, and we both left distinctly peckish. So, all-rounder or identity crisis? Visiting Artigiano was a frustrating experience, partly because there’s so much to like and it’s good at many things. The tea and coffee are well worth trying. The cakes, which I’ve enjoyed on a previous visit, are also very good. The selection of craft beers, ciders and wines is rather nice and on a weekday night the upstairs still feels like a cool little bolthole that the rest of Reading hasn’t cottoned on to yet. But I’m not a coffee reviewer or a bar reviewer: I’m a food reviewer, and on that basis Artigiano didn’t work for me. If I wanted somewhere small and independent I’d go to Shed. If I wanted somewhere polished and consistent I might well eat at Pret A Manger. Artigiano didn’t feel like it competed – in terms of cost, quality or service – with either of them. And I haven’t tried Gregg’s, despite the lure of the fake brickwork, but I wouldn’t put money on Artigiano being better than that either. So would I go back for food? Put it this way: Artigiano starts with art and ends with a no, and so does this review. Despite Reading being a pretty affluent town it’s always been short on Michelin stars. There’s a gathering around Bray (Orion’s Belt, if you like) and the two star Hand and Flowers out at Marlow but the only truly local “star” is L’Ortolan, in Shinfield (so close, it’s RG2 which I guess makes it our Alpha Centauri). As with most people I expect a Michelin star to make a restaurant fussy and pricey – although if Michelin themselves are to be believed, stars are awarded for food alone and, technically at least, have nothing to do with table linen or waiters in waistcoats. 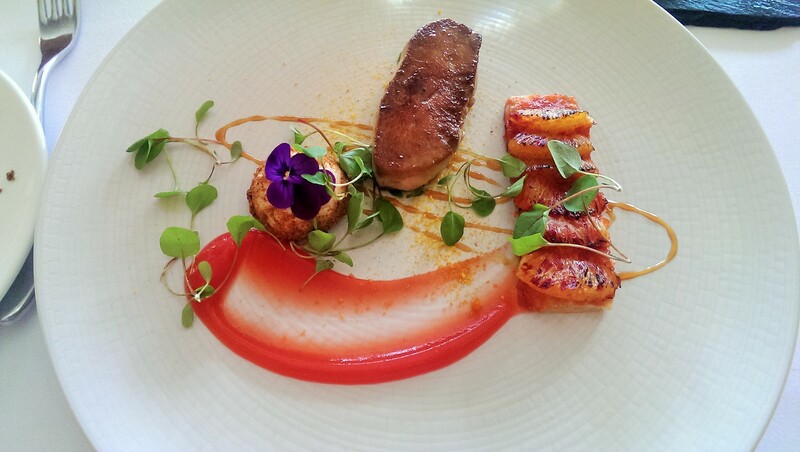 Even so, driving into the countryside to try L’Ortolan gave me a sense of trepidation: not just about whether the food would be any good, but also about whether I’d be up to reviewing it. Stepping over the threshold of Ortolan is like stepping inside a machine; the smartly dressed, suited staff are everywhere, taking coats, ushering customers to the bar, bringing drinks, wiping up invisible spills from the hardwood floor, plumping cushions. Everything looks impeccable, like a modern day clockwork Downton Abbey. Over a drink in the bar we were served canapés on a slate, just enough to get our tastebuds firing. Michelin starred dining is full of these bits and bobs – pre-pre starters, pre-starters, pre-desserts – and these were a nice enough introduction. There were little airy crackers with potato and onion, a thin wooden cone full of maple and truffle popcorn, the maple hitting you first and the truffle sneaking in at the end. The best of them were goose and foie gras croquettes, smooth and rich, Eton Turkey Twizzlers. People often say it’s possible to eat affordably at a Michelin starred restaurant (normally, ironically, in a review where they’ve made no attempt to do so) so we were both picking from the lunchtime prix fixe. Three courses, with three or four choices per course, comes to thirty-two pounds: or it will do, at least, if you don’t pick one of the dishes with a five or ten pound supplement. Narrow, yes, but not so narrow as to be constricting, with lots of interesting choices to make. So we sat in the bar, sipping our pre-prandials, feeling pampered and making our decisions. Only when our orders had been taken and our glasses were empty did we go into to the restaurant proper: places like L’Ortolan are very good at letting you take your time. Being taken through to the dining room revealed two rooms, one on the austere side, and the other, a conservatory room with a tented ceiling, harking back to the Raj. I was glad to be sat in the latter as it felt a little more relaxed. Tables in both rooms were the same, with smart linen, a fancy glass plate at each setting (soon whisked away, which begged the question of what it was there for) and comfy if slightly awkwardly angled velvety seats. 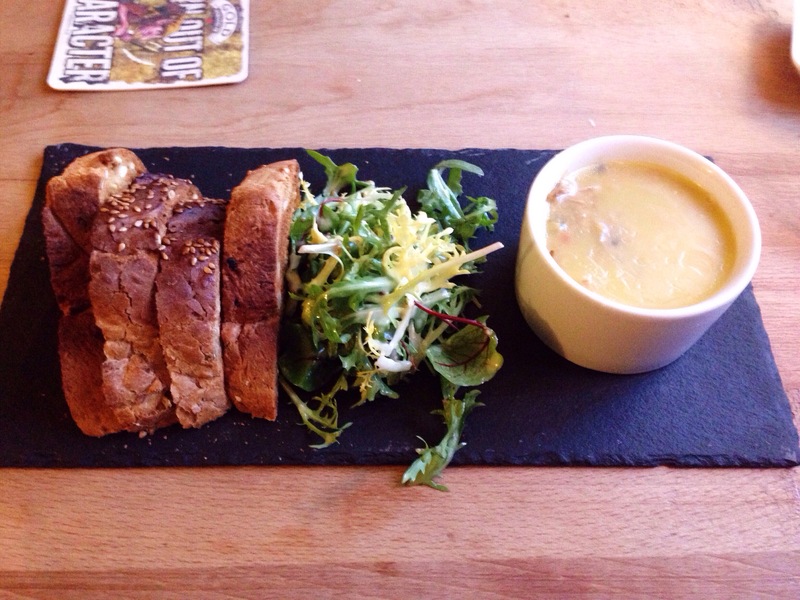 A big bowl of bread soon arrived and we tucked in while waiting for our starters to arrive. The best of them was a small treacle baguette, which was a golden saffron colour inside and slightly sweet with a hint of black treacle, The other breads – sourdough, focaccia and a small seeded roll – were nice, if not quite at the same heights, and there was plenty of room temperature butter (stinginess with butter is one of my bugbears, but then I do like a lot of it). Before our starters arrived there was a pre dessert – an espresso cup of soup (isn’t it always?). This was a rich but light mushroom velouté which had a hint of truffle, a tiny sourdough crouton and a deliciously sweet and sour pickled mushroom. I enjoyed it so much that fighting the urge to clean the inside of the cup with a piece of bread was quite a titanic struggle; I didn’t want to let the side down with all the other genteel tables around me. The starters were both beautiful to look at. The duck liver (introduced as foie gras when brought to the table) with blood orange and basil marmalade was heavenly, even for something so sinful. The liver was just cooked with a slightly caramelised outside. Next to it was a small dome of creamy duck liver parfait with pain d’epice crumb, all lovely and gingery. On a slice of flattened puff pastry were neatly laid slices of blood orange, resting on some of the marmalade. The marmalade itself was more like a curd, a thick smear of it (they do love smears in restaurants like this) on one side of the plate. Ordering this involved paying a five pound supplement, but it was a good decision: it was the best thing I ate all afternoon, and writing this makes me want to have it all over again. In particular the sweet richness of the liver with the tart blood orange was fantastic, and not a combination I’d ever have imagined before. The other starter also looked gorgeous, but looks were the main thing going for it. On paper, confit salmon, pickled cucumber and ketjap manis gel sounded terrific but what turned up had a strong air of seeming like a good idea at the time. The salmon was lovely – subtle, fresh and breaking into flakes with no effort at all (which took me aback, since it looked so much like sashimi). And I wouldn’t have minded it being so petite, if it had had more interesting things on the plate to pair it with, but I wasn’t that fortunate. The pickled cucumber, big indelicate chunks, had almost no sweetness or sharpness so was watery and bland. The ketjap manis gel was sweet and intense. But the rest? Well, it felt an awful lot like sludge to me: swirls of two different other sauces spiralling round the plate, a little heap of horseradish snow and micro herbs strewn all over the shop. Wetness, wetness everywhere. Towards the end I found some sesame seeds – strong, intense, delicious – submerged where they were almost unnoticeable and beyond rescue. It was the sort of plate you never quite clean: it looked like a Pollock once I was finished. They brought more bread after that, and I started to wonder whether I’d need it. For main, the rump of beef was as lovely as the duck liver. It was three very pink (as requested) slices of beef with smoked pommes Anna on a red wine jus with bone marrow hollandaise. Underneath the beef was half a roasted banana shallot, a few pieces of tenderstem broccoli, two cubes of dense beef and a creamy mushroom sauce, dotted with mushrooms. The rump itself was a little tough under the knife but tender when chewed. The potatoes were wafer thin and richly flavoured (almost like the potatoes my mum used to cook in with the roast beef when I was a kid, although the Michelin inspectors never troubled my mum’s kitchen – or yours, I’d imagine). The shallot was sweet and the mushroom sauce was intensely flavoured. 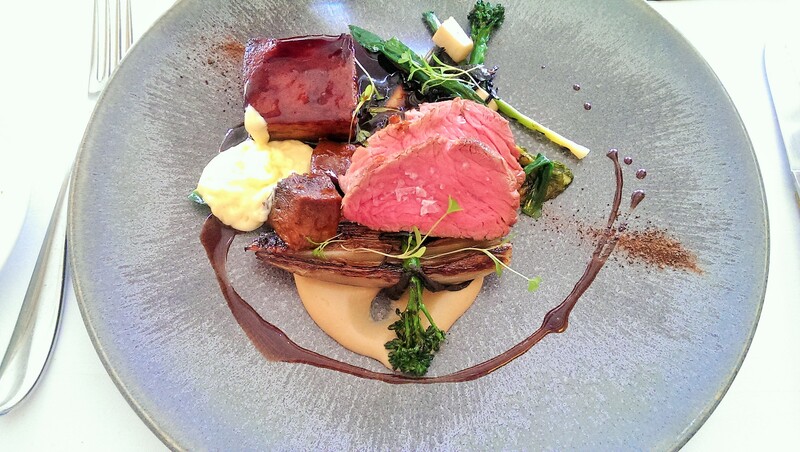 There was only one blot on the copybook – one of the cubes of beef, a big layer of fat running through it, was far too tough to cut or to eat – but apart from that, it was perfection, a high-end reinvention of a Sunday roast, where each ingredient was so concentrated and intense that size simply did not matter. 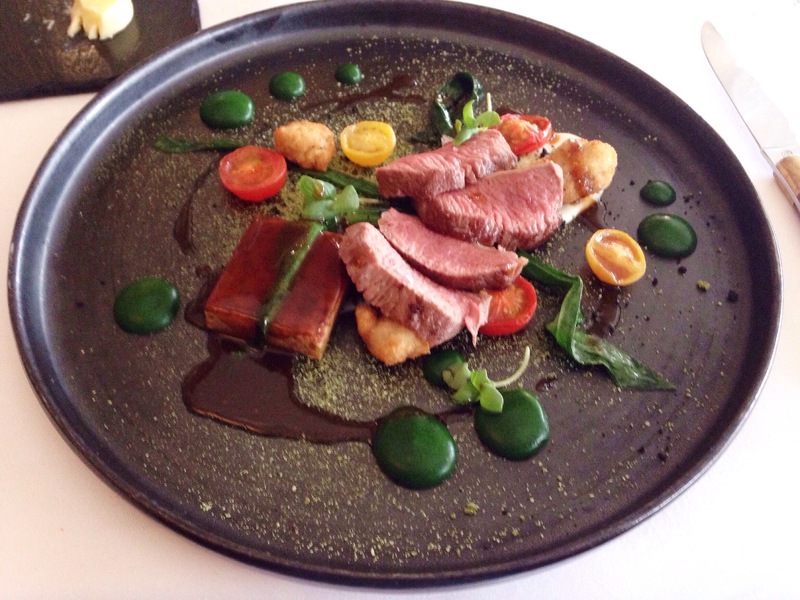 The other main had sat up and begged to be ordered when I saw the menu: loin of lamb, Parmesan gnocchi, sweetbread popcorn, confit tomato. Again, it looked absolutely gorgeous, and the lamb was beautifully cooked, what there was of it anyway. But again the rest of the dish underwhelmed. The confit tomatoes were the best, little bright-coloured flashes of sweetness. The sweetbreads were an Eton reimagining of KFC popcorn chicken – nice enough but maybe not the surprise I’d been hoping for. The gnocchi was one single chewy wodge whose main role in proceedings seemed to be to show off how delicious the Pommes Anna on the other plate were. And, of course, more little spheres and splodges of sauce – along with, randomly, a smear of something that tasted like goats cheese. Oh, and more of those sesame seeds. I’ve never believed that food should ever be too beautiful to eat, but unfortunately this was more fun to look at than to eat. There was a ten pound supplement for this and I’m not really sure why, because it was smaller, lighter and far less special than the beef. More freebies followed with an impeccable pre-dessert: a little shot glass with creamy coconut rice pudding at the bottom, little cubes of rum jelly above it and a layer of passion fruit mousse at the top. I could quite easily have eaten a dessert sized portion of this. Not for the first time in a high end restaurant, I wondered why the free stuff always seems to taste the best. Maybe because it’s “free”: I know, ultimately, it isn’t but sometimes the mind is quite happy to let itself be tricked. For dessert I simply had no choice but to have the cheese: I’d seen the cheese trolley wheeled past on several occasions while I finished the previous two courses and it was impossible to resist. There were a mind-boggling twenty cheeses on offer – going from the hard cheeses, past goats cheeses and on to some softer-rinded cheeses with varying degrees of stinkiness – all of which were explained in detail by the captain of the trolley, a really personable young man with obvious enthusiasm for his charges. I was allowed four, which were served with super thin slices of bread and crackers, and a choice of chutney and truffle honey. There were also grapes and celery just in case I wanted to offset some of the calories, although I’d given up counting by that point. The ones that stood out for me were the Burwash Rose, a rich, tangy, semi soft cheese with a rind washed in rose water and the Blue Murder, a Scottish blue so ripe it was in danger of running off the plate (or, rather, slate) and, for that matter, out of the building. 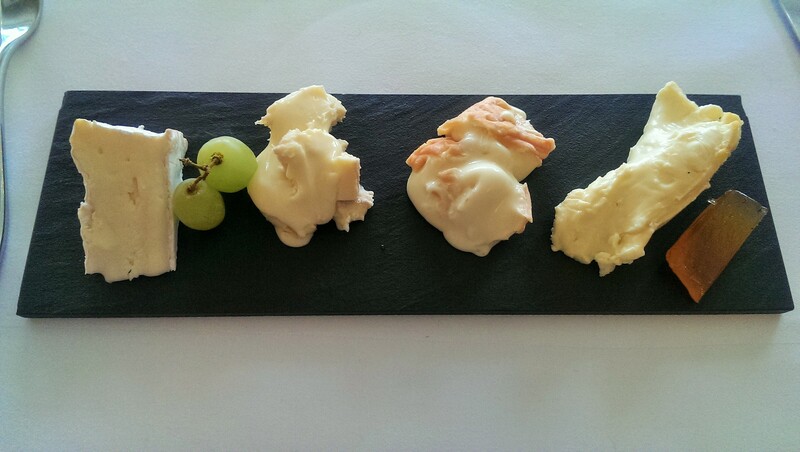 The latter was particularly good with some of that honey, although the truffle couldn’t stand up to the cheese itself and was close to undetectable. This plate also attracted a five pound supplement but the variety was so good (perhaps not in the hard cheeses – I was hoping to see a really good Gruyere or Comte, but it was not to be) and the portion sufficiently generous that I didn’t begrudge them one bit. 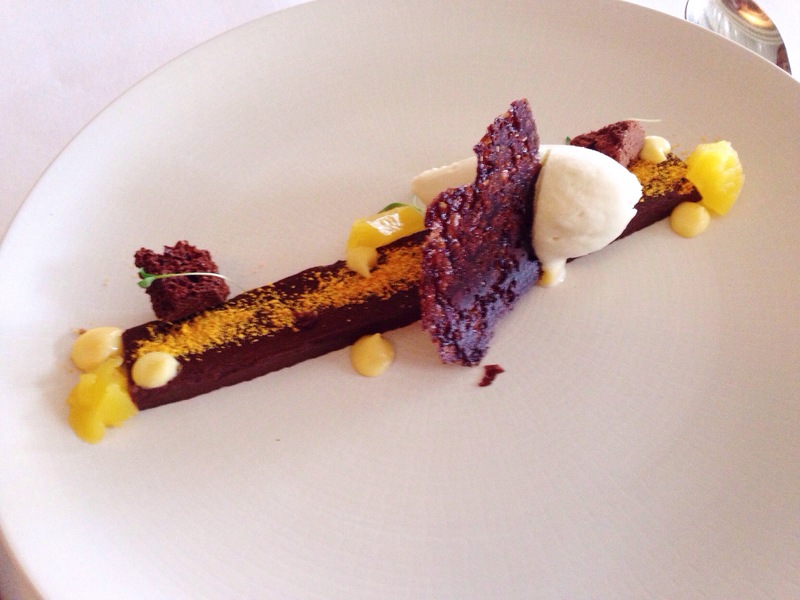 The other dessert was chocolate and cardamom ganache with orange curd and mint ice cream. Unlike many of the things I’d eaten, that was a pretty good description and – for the only time in the meal – what turned up was roughly what I’d expected to see. It was bliss: a long thin rectangle of smooth, glossy ganache, powdered with cardamom, was just gorgeous. The mint ice cream – green, fresh garden mint, a million miles from bright green mint choc chip – was so fantastic I didn’t want to pair it with anything else. The orange curd zinged with sweet sharpness. Best of all, perhaps, was the kitchen’s reinterpretation of Mint Aero – three little chunks of fluffy chocolate which imploded in the mouth, a piece of culinary pyrotechnics. Just beautiful. And, in case you’d forgotten the kitchen has a Michelin star, some pointless micro leaves. I knew the wine list would sting, and it did. As I was driving, the initial plan was to order wine by the glass but the prices by the glass were so punitive – seven or eight pounds for 125ml, easily a tenner for 175ml – that we decided it would be better value to get a bottle from the bottom end of the wine list and picked a Cote du Rhone for thirty-seven pounds (to give you an idea, that’s the fifth cheapest red they sell by the bottle). I was feeling really pleased with my bargain hunting until I got home, did some research and found that the same bottle retails for eleven pounds. Still, there was no bitter taste at the time. Service was excellent, if a little cool. There was a constantly rotating team of waiters which served plates, cleared plates, poured wine and poured water, which gave the feeling of being continuously “served” but without a lot in the way of interaction. It was exceptionally well-run, just a tad emotionless. A few of the waiters – the captain of the cheese trolley, one of the waiters who topped up our glasses – seemed to have a little more charm, it’s just a shame that this was the exception rather than the rule. Perhaps customers at Ortolan (who do tend to be older and middle class, based on the clientèle when we were there) expect service of the “seen and not heard” variety, or perhaps my expectations have been skewed by too much casual dining. I would blame Michelin – lots of people like to – but I’ve eaten at other starred restaurants which felt a lot less, well, starchy. The total bill, including a 12.5% “optional” service charge, for two drinks from the bar (one of them soft), a bottle of wine and three courses was one hundred and forty five pounds. So, I tried to eat cheaply at L’Ortolan and I have to say it’s just not really possible: we could have saved twenty pounds on supplements but even then it would be pretty difficult to get the bill under a hundred pounds unless neither of you were drinking. I found L’Ortolan such a mixed bag that it’s difficult to wrap it all up in a neat and easy conclusion. I almost feel like there were two different meals here: the duck liver and beef were fantastically well-judged, well-balanced, generous and delicious dishes where it felt like there was more to them than expected. The salmon and lamb was the opposite – too delicate and light without enough oomph to stop them from being damp squibs. I guess the question is, if you went to L’Ortolan, which of those two meals you’d get. If it was the first, you’d be evangelising to friends, but if it was the second you’d be wondering what the fuss was about. I think in the back of my mind I was partly comparing the prix fixe at L’Ortolan with the a la carte somewhere like Mya Lacarte and thinking about differences in the food, the execution, the ideas and the experience. In a straight-out comparison, I’m not sure L’Ortolan would win out very often, however stunning the building, beautiful the dishes, plentiful the freebies. Maybe that’s about me and the kind of dining I prefer, so disregard it by all means: it’s worth going to say you’ve gone, and you’re unlikely to have a bad meal if you do. But, to me at least, it still felt ever so slightly like eating in a machine – and good restaurants are a broad church of many things, but I don’t think machine is one of them.